Recently, with the development of networks and smart devices, the demand for Ultra High Definition (UHD) video has risen, and HTTP adaptive streaming has attracted attention. HTTP adaptive streaming can guarantee high Quality of Experience (QoE) because it adaptively selects the video quality according to the network state. However, the existing quality control schemes experience unnecessary quality changes and low average video quality due to the bandwidth measurement and the quality control that do not consider the Variable Bit Rate (VBR) content characteristics of the UHD video. In this paper, we propose an adaptive quality control scheme based on VBR content characteristics to improve QoE of UHD streaming service. The proposed scheme measures the bandwidth using the actual bit rate of the segment and the difference in the network adaptability between segments. Furthermore, the proposed scheme defines a quality control region by considering the buffer state of the client. The quality control region consists of four subregions based on buffer thresholds, and the client selects the quality differently according to each subregion. Experimental results have shown that the proposed scheme improves the QoE compared to the existing schemes by minimizing the unnecessary quality changes and maximizing the average video quality. Cisco, "Cisco Visual Networking Index: Global Mobile Data Traffic Forecast Update, 2016-2021," Mar. 2017. J. Kua, G. Armitage, and P. Branch, "A Survey of Rate Adaptation Techniques for Dynamic Adaptive Streaming over HTTP," IEEE Communications Surveys & Tutorials, Vol. 19, No. 3, pp. 1842-1866, Mar. 2017. T. Stockhammer, "Dynamic Adaptive Streaming over HTTP: Standards and Design Principles," Proc. of the Second Annual ACM Conference on Multimedia Systems, pp. 133-144, Feb. 2011. 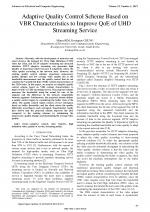 M. Seufert, S. Egger, M. Slanina, T. Zinner, T. Hossfeld, and P. T. Gia, "A Survey on Quality of Experience of HTTP Adaptive Streaming," IEEE Communications Surveys & Tutorials, Vol. 17, No. 1, pp. 469-492, Sep. 2014. T. Zhao, Q. Liu, and C. W. Chen, "QoE in Video Transmission: A User Experience-Driven Strategy," IEEE Communications Surveys & Tutorials, Vol. 19, No. 1, pp. 285-302. Oct. 2016. Y. Sani, A. Mauthe, and C. Edwards, "Adaptive Bitrate Selection: A Survey," IEEE Communications Surveys & Tutorials, Vol. 19, No. 4, pp. 2985-3014. Jul. 2017. Y. Zhou, Y. Duan, J. Sun, and Z. Guo, "Towards Simple and Smooth Rate Adaptation for VBR Video in DASH," Proc. of IEEE Visual Communications and Image Processing Conference, pp. 9-12, Dec. 2014. F. Xie, M. T. Pourazad, P. Nasiopoulos, and J. Slevinsky, "Determining Bitrate Requirement for UHD Video Content Delivery," Proc. of the IEEE International Conference on Consumer Electronics, pp. 241-242, Jan. 2016. T. Nagashima, K. Kanai, and J. Katto, "QoS and QoE Evaluations of 2K and 4K DASH Contents Distributions," Proc. of the IEEE International Symposium on Multimedia, pp. 453-458, Dec. 2017. T. Zhang, F. Ren, W. Cheng, X. Luo, R. Shu, and X. Liu, "Modeling and Analyzing The Influence of Chunk Size Variation on Bitrate Adaptation in DASH," Proc. of the IEEE International Conference on Computer Communications, pp. 1-9, May 2017. S. Bae, D. Jang, and K. Park, "Why Is HTTP Adaptive Streaming So Hard?," Proc. of the Asia-Pacific Workshops on Systems, Jul. 2015. Y. Liu and J. Y. B. Lee, "Streaming Variable Bitrate Video over Mobile Networks with Predictable Performance," Proc. of the IEEE Wireless Communication and Networking Conference, pp. 1-7, Apr. 2016. K. Brunnstrom et al., "Qualinet White Paper on Definitions of Quality of Experience," Qualinet White Paper on Definitions of Quality of Experience Output from the 5th Qualinet Meeting, 2013. N. Staelens, M. H. Pinson, P. Corriveau, F. De Turck, and P. Demeester, "Measuring Video Quality in the Network: From Quality of Service to User Experience," Proc. of the International Workshop Video Process. Consumer Electron, pp. 5-6, 2015. H. Nam, K. H. Kim, and H. Schulzrinne, "QoE Matters More Than QoS: Why People Stop Watching Cat Videos," Proc. of the IEEE International Conference on Computer Communications, pp. 1-9, Apr. 2016. P. Juluri, V. Tamarapalli, and D. Medhi, "Measurement of Quality of Experience of Video-on-Demand Services: A Survey," IEEE Communications Surveys & Tutorials, Vol. 18, No. 1, pp. 401-418. Feb. 2015. C. Liu, I. Bouazizi, and M. Gabbouj, "Rate Adaptation for Adaptive HTTP Streaming," Proc. of the ACM Multimedia Systems, pp. 169-174, Feb. 2011. T. C. Thang, Q. D. Ho, J. W. Kang, and A. T. Pham, "Adaptive Streaming of Audiovisual Content using MPEG DASH," IEEE Transactions on Consumer Electronics, Vol. 58, No. 1, pp. 78-85, Mar. 2012. Z. Li, X. Zhu, J. Gahm, R. Pan, H. Hu, A. C. Began, and D. Oran, "Probe and Adapt: Rate Adaptation for HTTP Video Streaming At Scale," IEEE Journal on Selected Areas in Communications, Vol. 32, No. 4, pp. 719-733, Apr. 2014. H. T. Le, D. V. Nguyen, N. P. Ngoc, A. T. Pham, and T. C. Thang, "Buffer-based Bitrate Adaptation for Adaptive HTTP Streaming," Proc. of the International Conference on Advanced Technologies for Communications, pp. 33-38, Oct. 2013. T. Huang, R. Johari, N. McKeown, M. Trunnell, and M. Waston, "A Buffer-based Approach to Rate Adaptation: Evidence from a Large Video Streaming Service," Proc. of the ACM Conference on SIGCOMM, pp. 187-198, Aug. 2014. K. Spiteri, R. Urgaonkar, and R. K. Sitaraman, "BOLA: Near-optimal Bitrate Adaptation for Online Videos," Proc. of the IEEE International Conference on Computer Communications, pp. 1-9, Apr. 2016. P. Juluri, V. Tanarapalli, and D. Medhi, "SARA: Segment Aware Rate Adaptation Algorithm for Dynamic Adaptive Streaming over HTTP," Proc. of the IEEE International Conference on Communication Workshop, pp. 1765-1770, Jun. 2015. T. Vu, H. T. Le, D. V. Nguyen, N. P. Ngoc, and T. C. Thang, "Future Buffer Based Adaptation for VBR Video Streaming over HTTP," Proc. of the International Workshop on Multimedia Signal Processing, pp. 1-5, Oct. 2015. H. N. Nguyen, T. Vu, H. T. Le, N. P. Ngoc, and T. C. Thang, "Smooth Quality Adaptation Method for VBR Video Streaming over HTTP," Proc. of the International Conference on Communications, Management and Telecommunications, pp. 184-185, Dec. 2015. 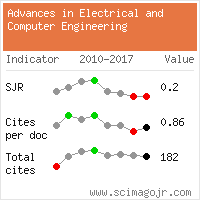 Citations for references updated on 2019-04-16 09:44 in 155 seconds.